Bucks County Designer House: An EXCITING find! I ran into this antique shop between appointments, and an amazing, huge, antique gold mirror caught my eye. Hello lovely readers. I’m so happy to share with you an exciting new item I found for my designer house room!! First of all, I thought you might like to see the mess that IS my Bucks County Designer House Sunroom…I tell everyone it WILL get worse before it gets better! A jumble of furniture, rugs, and accessories as the room starts to take shape. Can you see the capiz chandelier in place where the ceiling fan used to be? And my beautiful chevron patterned cowhide rug rolled up on the floor? I’ve been brewing about the space behind the settee for awhile now. Since I’ve chosen to place the settee on the diagonal in the right hand corner of the Sunroom, that leaves a large-ish gap between the settee and the corner. I had planned on placing some pedestals with plants, hanging baskets, a large piece of art, or something along those lines. 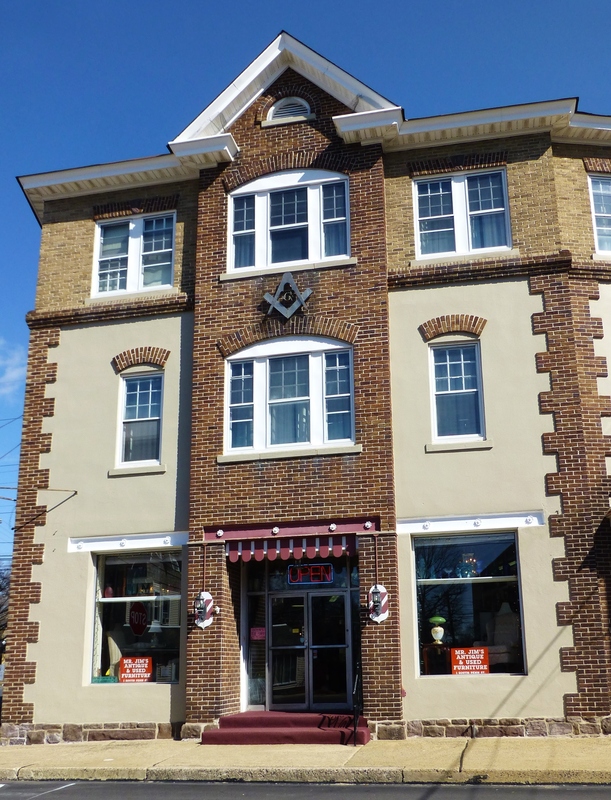 Then I popped into one of my favorite local antique shops: Mr. Jim’s Furniture & Antiques in Hatboro, PA.
Mr. Jim’s Antiques is in an old Masonic Lodge building in Hatboro, PA. They have great vintage and antiques furniture and accessories, so I try to stop by when I’m their neighborhood. Well, the other day I ran into their shop between appointments, and this amazing, huge, antique gold mirror caught my eye. 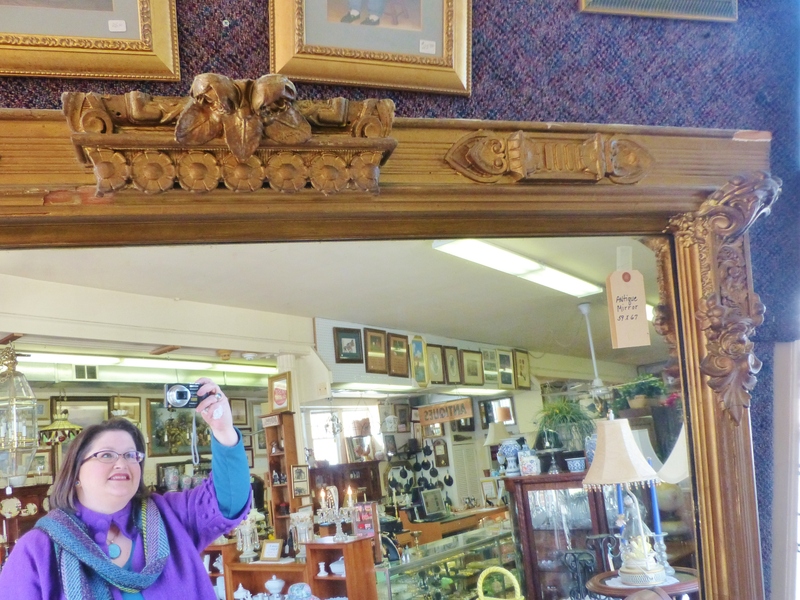 Here I am, taking a snap shot of the fantastic Victorian gold mirror I found at Mr. Jim’s Furniture & Antiques. You can see some of their wonderful inventory behind me, reflected in the mirror. The mirror measures approximately 59″ Wide by 67″ High. It’s the perfect size to sit upon the stone ledge behind the settee. By placing the two bottom corners up on the ledge and tethering the whole thing to the corner with eye hooks and chain, I’ve safely managed to display the mirror in a way that makes me so happy!! Now the mirror is one of the first things you see when entering the space, and it becomes one visual entity with the settee–a true focal point, drawing you down into the space. The mirror also beautifully reflects the capiz chandelier and the opposite corner of the room which will have the dressing screen and the duchesse brisee. So exciting! 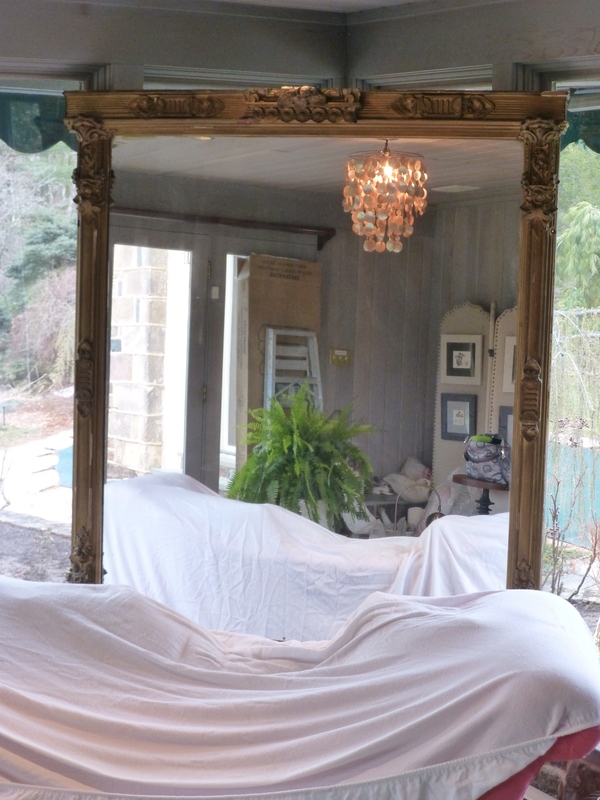 A peek at the mirror in place (and the chandelier, dressing screen, etc. reflected in the mirror). The settee is covered with a sheet, just to keep the dust off while everyone is working in the house, and my window treatments are not yet installed, of course. Can you see the drapery rod above the door, reflected in the mirror? That’s where the full-length draperies will hang–they are being fabricated in the same coral linen that’s on the settee. The draperies will be bold and beautiful reflected in the mirror! And, of course, the valances will still be installed all around the room and above the mirror as well. Right now it all still looks like a jumble, but very soon everything will come together, and the room will really come to life. 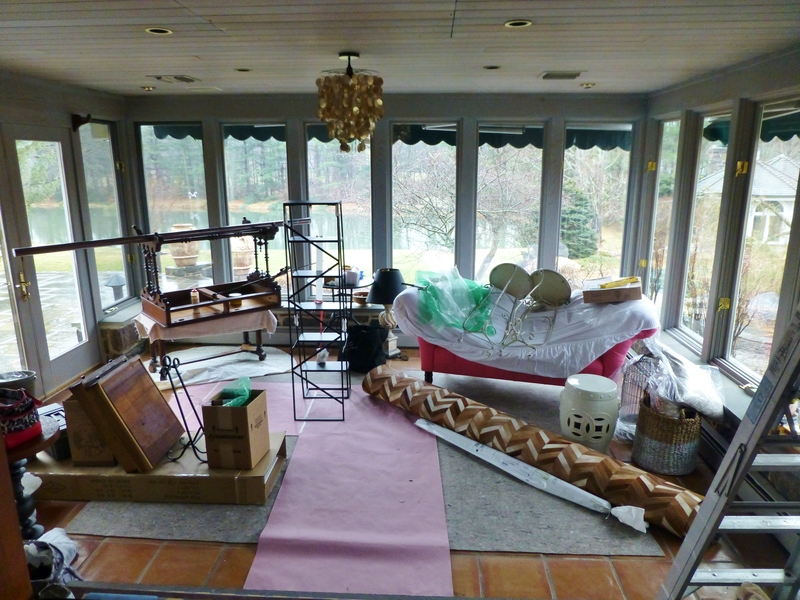 It’s sooo much work, but it’s also such a thrill to see the Sunroom taking shape. This entry was posted in Antiques, Designer House, Furniture, Interior Design, Interior Design & Decorating and tagged Bucks County Designer House, Decor, Decorate, Decorating, Interior, Interiors, Robinson interiors, Shopping. Bookmark the permalink. That mirror is gorgeous!!! What a great find! It looks like things are really coming together…I can hardly wait to see the final result! I’ll have to check out Mr. Jim’s sometime. I love to find new vintage and antique stores. I also just bought my BCDH ticket the other day so I’ll be attending at some point – looking forward to it!